Call Shred Wise, Inc. today for all of your residential and commercial paper shredding needs in Westminster. We offer customizable shredding solutions with exceptional customer service at cost-effective prices. By working with our document destruction specialists, you’ll ensure that you get the best program for your needs and budget. Our services include on-site mobile shredding, off-site mobile shredding, and drop-off shredding services in Westminster. Our mobile shredding services in Westminster are available Monday through Friday, and drop-off shredding is available seven days a week. With our high-capacity, state-of-the-art mobile shred trucks, our dedicated and carefully screened shredding professionals can handle nearly any volume of paper. With every shredding job, we guarantee that the paper we shred will be 100% destroyed and recycled. To verify this, we invite our clients to witness the shredding process and always issue a Certificate of Destruction for their records. Our shredding process is based upon NAID’s high standards for information destruction, and complies with today’s strict laws regarding privacy protection, such as FACTA, GLBA, and HIPAA. Shred Wise is a family-owned and -operated, local business that prides itself on offering exceptional customer service to our Westminster clients. We treat them as we would want to be treated. That’s why we offer flexible, friendly, and dedicated shredding services at very competitive rates. Plus, because we have been victims of identity theft ourselves (just before we started our shredding business), we fully appreciate the critical role we play in safeguarding personal and sensitive information. So, you can trust we’ll never cut corners when it comes to our shredding procedures. Contact us today for a free estimate or to learn more. The majority of our clients in Westminster come to us for on-site document destruction. Whether they’re needed for a one-time purge or the ongoing management of sensitive information, our on-site mobile shredding services in Westminster are designed to be effective and affordable for both residential and commercial clients. Our mobile shredding service utilizes a shred truck with the ability to destroy 6,000 pounds of paper an hour. This means that we can shred all of your paper in just a matter of minutes, right in front of your home or business. We are happy to collect your papers from your home or office, pour them into security bins, and transport them out to our truck, where they can be dumped into the shredding area using a fully automated lifting arm, making our shredding process virtually “hands free.” Once all of your paper has been shredded, we continue to make stops along our service route. At each stop, more paper is shredded and pushed into the storage area with a compaction ram. Every time this happens, the papers get mixed and become more and more diluted. All of this paper is then taken to a recycling facility to be made into new paper products, and we issue a Certificate of Destruction to each of our clients. Because our on-site mobile shredding services are so thorough, our Westminster clients can rest assured that their documents will be completely destroyed. And, because we are local company that keeps its service routes in Orange County, we can promptly respond to last-minute requests. Another convenient option for those in Westminster who need to shred a large quantity of sensitive and confidential documents is our off-site mobile shredding service. 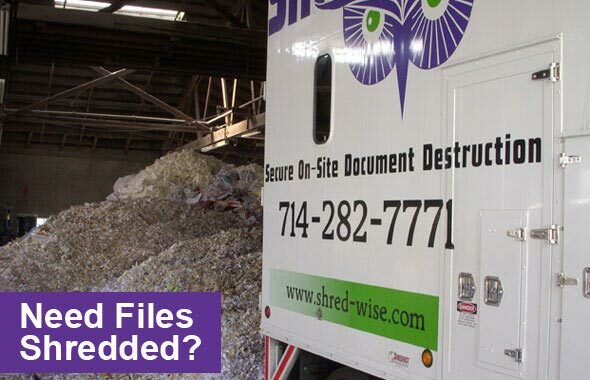 This service still uses our mobile shred trucks to destroy your documents, but we conduct all of the actual shredding off site at our facility in Orange — rather than at our client’s home or business. Off-site shredding is usually necessary when our truck doesn’t have enough overhead clearance to get close to a client’s building, or when our clients are located on a hill where we would not be able to park in a flat area to shred. In these cases, we’ll send out our secure panel truck to the client’s home or business in Westminster and pick up all of the paper they want destroyed. The paper is then shredded and recycled according to the industry’s best practices. To obtain a quote for your off-site mobile shredding needs in Westminster, give us a call. If you have just a few boxes of paper to shred, you can simply bring your paper directly to us. There’s no need to remove staples, rubber bands, or paper clips. Our drop off location is inside of Saddleback Equipment & Party Rentals, 3222 E. Chapman Ave., Orange, CA 92869. We provide drop-off shredding services from 7am to 5:30pm, Monday through Saturday, and from 8am to 12pm on Sundays. You will be given a Certificate of Destruction. As with all of our shredding services, we guarantee that 100% of the paper we shred will be recycled. Call us today at (714) 282-7771 for a free quote. If you are interested in setting up ongoing shredding services in Westminster for your business, call us today. We can schedule our mobile shredding service to occur bimonthly, monthly, biweekly,weekly, or quarterly, depending upon your needs. Our service agreements are simple (we only require 30 days’ notice to cancel), flexible, and easy to understand. There are no hidden fees and we will lock in your rates for one year. As an added bonus, when you sign a service agreement for recurring shred visits, you’ll be able to use our lockable shred consoles and rolling bins for free throughout the term of the agreement. Additionally, by outsourcing your paper shredding, you won’t have to trust one of your employees to handle the destruction of your most confidential information. Instead, you’ll have a carefully screened staff member of Shred Wise come on site to your shredding. They’ll empty the bags of paper from the shred consoles directly into a lockable rolling bin, and then take all of the rolling bins outside to the mobile shred truck. Our trucks feature a fully automated lift arm to pick up and empty each bin into the shredder. Once we are done, we’ll issue you a Confirmation of Destruction, which you can retain as proof of destruction. Why Invest In Professional Document Destruction Services for Your Westminster Business? If you have a business, professional document destruction services contribute to safeguarding the proprietary and sensitive information of your business, employees, and clients, and help to ensure your compliance with local and federal privacy laws. If you don’t take steps to comply with current privacy regulations, it not only exposes your Westminster business to unnecessary risks, but can also lead to huge fines. For these reasons and more, everyone from the small two-person shop to the large corporation in Westminster stands to benefit from our range of mobile shredding services. By providing these businesses with safe, secure, and reliable shredding services in Westminster at affordable rates, we help them comply with privacy legislation, protect their proprietary information, reduce their risks and liabilities related to data breaches, and maintain the trust of their employees and clients. Call and speak with one of our experts. Call Shred Wise at (714) 282-7771 Today! 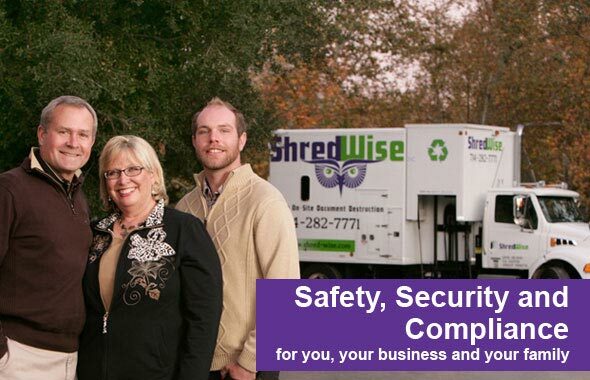 Shred Wise Inc. is a locally based, family-owned and -operated mobile shredding company. We have been serving the paper destruction needs of the local Westminster community since 2006, and know how to customize our shredding services to accommodate a wide range of needs, from those who are preparing a last-minute clean out to those who want ongoing, regularly scheduled shredding service. We are licensed and insured, and National Association for Information Destruction (NAID) compliant. 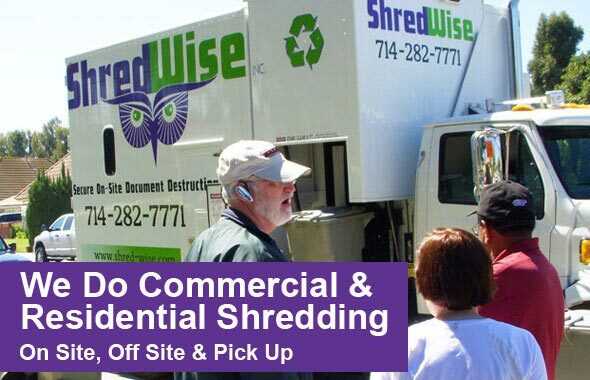 Our office recently had Shred Wise, Inc. come to our office and pick up confidential files to be shredded and they were beyond professional and couldn't do enough for us! I would 100% refer Shred Wise, Inc. to anyone who is looking for a company that goes above and beyond to make the transition of shredding confidential files. We are a Medical Office in Orange and again, we were very pleased with their professionalism!